Dr Maurice Saxby: "My love of children's literature came from my love of reading, really." If the National Year of Reading aims to engage more children with the written word, then it is only fitting to honour one of children's literature's biggest advocates, who has dedicated much of his life to that goal. Dr Maurice (Maurie) Saxby AM, a distinguished alumnus of the Faculty of Education and Social Work, will delight guests this Wednesday evening with a historical tour of children's literature at the event An Australian Story - Maurice Saxby on Children's Literature. "Maurice Saxby is a champion of the importance of children's literature in enriching the lives of children and young people. He is sometimes called the fairy godfather of children's literature in Australia," said Professor Robyn Ewing, who was invited earlier in the year by the CBCA to give the inaugural lecture in honour of Dr Saxby. Dr Saxby was the first National President of the Children's Book Council of Australia (CBCA), an organisation he has supported for over 60 years, and his multi-volume History of Australian Children's Literature is the benchmark title on the topic. 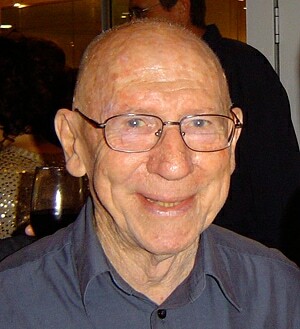 He has received a variety of accolades, including the Dromkeen Medal in 1983, an Order of Australia in 1995, and in 2002 he won the CBCA's Nan Chauncy Award for his immense contributions to Australian Children's Literature. Dr Saxby is also a former teacher and teacher librarian, academic and writer who completed his Masters of Education at the University of Sydney before lecturing nights in the Bachelor of Education course. "My connections go back to the faculty from a long, long way and they are pretty firm and well founded," says Dr Saxby. Wednesday evening's event will be in-conversation style with Professor Geoff Williams, Emeritus Professor of Language and Literacy Education at the University of British Columbia, who has also held senior lecturer appointments at the University of Sydney. Dr Maurice Saxby remembers him well. "Both Geoff Williams, who is doing the interview, and Robyn Ewing, who is a Professor at the University of Sydney, were students of mine in the B Ed course, so we go back a long way. I feel like I'm part of the family," he says. And despite going on to a highly successful career as an award-winning writer and academic, Dr Saxby has maintained a close relationship to the Faculty of Education and Social Work. But Dr Saxby attributes his passion and drive for his work as coming from a simple place. "My love of children's literature came from my love of reading, really, and I started reading as a kid - then it just flowed on naturally", he says. "If kids are reading, they are given access to language, and not just language skills, but the thoughts behind what is being expressed in that language. They are meeting other worlds, they are meeting other people, they are looking for a home for themselves, and having great fun while they are doing it." Championing the view that reading holds value and is not just a fanciful pursuit has been one of the challenges for Maurice, who has discovered tactics to combat these negative views. "It's a question of exposing them to books that have depth. I don't mind children reading what other people determine as rubbish, because then you can give them something which has the same appeal, but which is more genuinely placed." It will be this reflection on the intrinsic worth of reading that will anchor tomorrow evening's event.